Thursday, 26 April 2018 is Poetry Day Ireland: a one-day festival that is all about celebrating Irish poetry. And this year the theme is Poetry Surprises. It's about the unexpected ways that the words, music, and rhythm of poetry enable us to see ourselves and our worlds in new and unexpected ways. 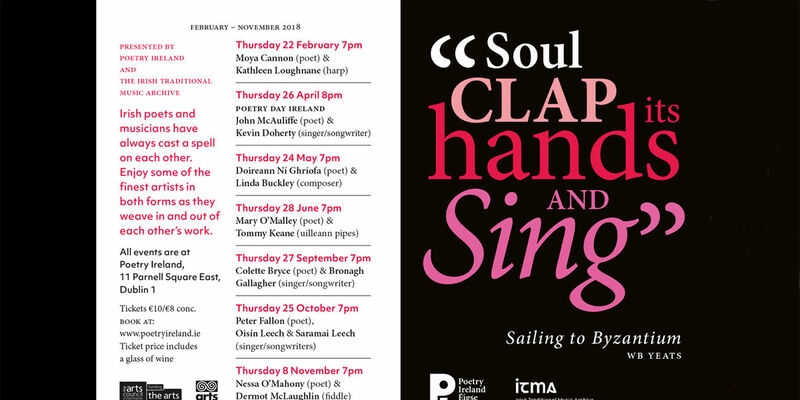 Celebrate serendipitous encounters in Poetry Ireland's Parnell Square premises on Thursday, 26 April 2018 at 8pm. Revel in the work of Kevin Doherty and John McAuliffe — a space where poetry and music overlap. 'Soul Clap Its Hands and Sing': 2018 season lineup. Poetry surprises. It knocks on your door and runs away. It greets you on the street with a face you haven't seen in years. Look in the mirror and poetry shows you the back of your head. It can rearrange the stars and resurrect the past. When your breath snags and your heart thumps; when something strokes your neck and makes you jump: that’s poetry. Born in Listowel, Co Kerry in 1973, John McAuliffe has lived in the UK since 2002. He co-directs the Centre for New Writing at the University of Manchester and has published four books with Gallery Press — most recently, The Way In was joint winner of the Michael Hartnett Award for Best Collection. John currently is the chief poetry critic for the Irish Times and co-editor of the Manchester Review. John's poetry 'is fundamentally one devoted to conveying the shifting textures of lived experience, from the altering gradations of daylight during a working day to the sudden strangeness of the world as perceived by a child.' He uses striking images, political references, and storytelling to offer commentary and construct his art. with its pretty forsythia border. and its hundred windows shining away. A free drift to nowhere in particular. All that way, and back again. To learn more about John and his work, visit his page at The Poetry Archive. Imagine a Donegal Leonard Cohen reinventing the 'Closing Time'-era Tom Waits and you're right there on Doherty's dog-eared, poet's page. Born in Buncrana, Co Donegal, Kevin Doherty is a singer-songwriter who learned his craft from listening to records and the radio. His early influences include bluegrass, country, folk, rock, blues, jazz, swing, and traditional music. He joined the traditional group Four Men and a Dog in 1991. Since that time, he has toured and recorded extensively — with the band, as a soloist, and in the company of fellow Buncrana-man Ciaran Tourish. Visit Kevin’s website to learn more. Kevin’s approach to songwriting, with his emphasis on storytelling and speech, is in itself poetic. Hearing him side-by-side with John McAuliffe highlights the overlapping ways that poets and singers use words and music to view their worlds. 'Rambling Irishman' from Kevin Doherty's 2012 solo album, Seeing Things (©Kevin Doherty, used with permission). Visit ITMA to hear other CDs by Kevin Doherty, as well as a selection of field recordings (available only at ITMA). 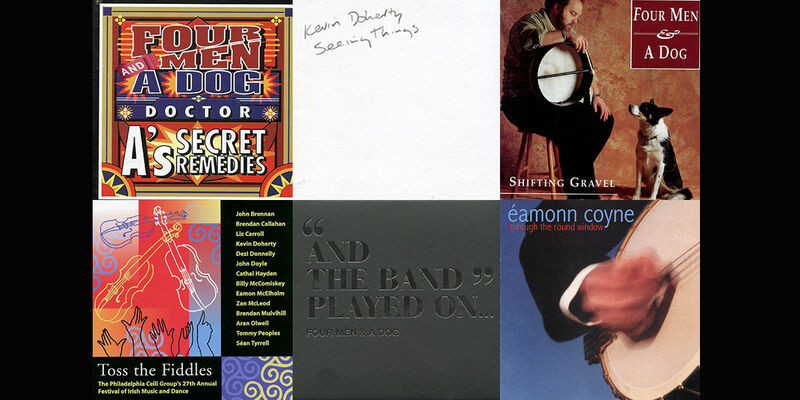 CDs in the ITMA collection featuring Kevin Doherty.